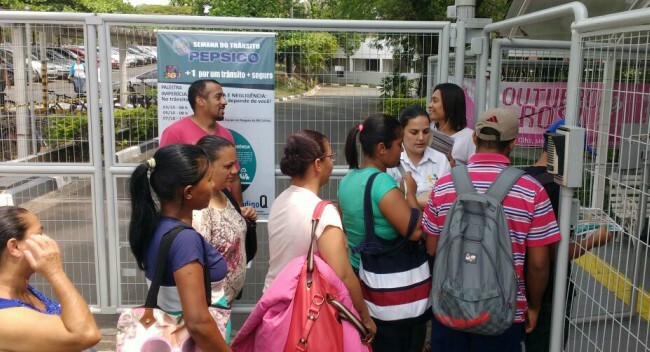 On November 29, after long and difficult negotiations, the Union of Workers of the Frito Lay Compañía Limitada (SITRAFRITOLAY) and the PepsiCo subsidiary signed a collective agreement for the first time. The agreement will be valid for three years between 2019 and 2021. 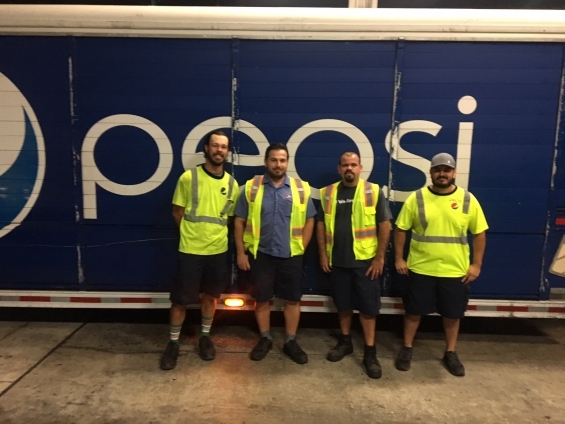 After six months of negotiations, over 200 Pepsi-Cola Bottling Company drivers, merchandisers and warehouse workers represented by Teamsters Local 683 ratified their newest collective bargaining agreement by more than an 80 percent margin. Workers of Liberty Coca-Cola and Pepsi Bottling Company who are represented by the IUF-affiliated Teamsters Local 830 in Philadelphia, have ratified a new agreement. A majority of the workers voted to accept the contract, which will last for five years. IUF-affiliated unions GMB and Unite the Union in the UK oppose the proposed closure of Norwich factory operated by Britvic, the licensed bottler for PepsiCo products within the UK, and the transfer of production to different UK locations. Varun Beverages reported that its board has approved a plan to acquire PepsiCo India’s previously franchised territories in Odisha and parts of Madhya Pradesh along with three manufacturing units. Upon completion of this acquisition, Varun Beverages will be a franchisee for PepsiCo products across 18 states and two union territories. On 2 March PepsiCo announced its proposal to close the UK Walkers crisp plant in Peterlee in Country Durham. 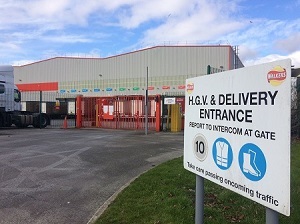 The US-headquartered food and beverage giant is shutting its facility in north-east England "In order to improve the efficiency of our UK snacks manufacturing operations" with production transferred to other UK sites. Around 400 jobs could be lost as a result of the closure. 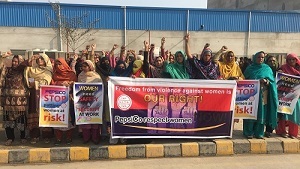 On 1 February 2017, more than 350 workers at the Frito-Lay plant in Lahore organized through the IUF-affiliated Pakistan Food Workers Federation (PFWF) a demonstration outside the plant against ongoing harassment against union members and particularly women workers. Click here to send a message to PepsiCo telling the company to respect trade union rights! 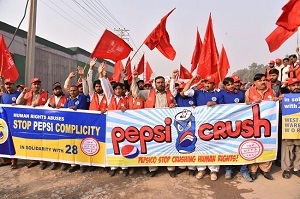 The Pakistan Food Workers Federation organized a protest action on 3 December in front of a PepsiCo beverage plant in Gujranwala. 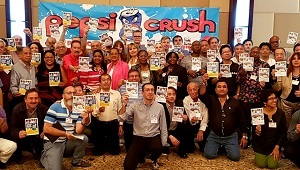 Hundreds of PepsiCo union members and community supporters showed their solidarity for the international IUF campaign in support of workers in Pakistan, India and Guatemala struggling to secure their basic human rights. IUF Affiliates at the Asia Pacific Regional Conference in Manila 19-21 October, show their support and solidarity with the 28 unfairly dismissed warehouse workers in West Bengal India. PepsiCo continues its pattern of crushing human rights at the Frito-Lay plants in Lahore, Pakistan and Guatemala City, Guatemala. STOP PEPSICRUSH! International delegates to the IUF Africa Regional Conference, that took place in Dar es Salaam, Tanzania on 22 and 23 November, showed their support for the PepsiCrush campaign and solidarity with the workers fighting for their human rights in Pakistan and Guatemala PepsiCo operations and a warehouse in India exclusively contracted to PepsiCo. Stop PepsiCrush! Workers at PepsiCo's Frito-Lay plant in Lahore continue fighting for their rights and for their union against a management which refuses to recognize their organization and their demands. 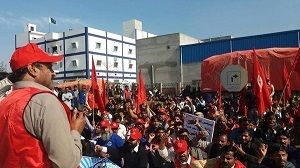 Hundreds of union members, backed by the Pakistan Food Workers' Federation and community supporters rallied at the factory gate in November to highlight their demand for an end to the harassment of union members and officers, negotiation on their charter of demands and an end to the massive abuse of casual employment. CLICK HERE TO SEND A MESSAGE TO PEPSICO! Stop PepsiCrush! International delegates to the IUF's hotel, restaurant, catering and tourism (HRCT) Trade Group Board meeting in Punta Cana, Dominican Republic November 10-11 show their solidarity with workers fighting for basic rights at PepsiCo facilities in Pakistan and Guatemala and the ongoing struggle for justice for warehouse workers at PepsiCo's warehouse provider in West Bengal, India. Women's committee of AIWU in Ukraine organized a second meeting on October 10-11, 2016 and joined the solidarity actions taken by the IUF affiliates in support of the workers fighting for their human rights in Pakistan and Guatemala PepsiCo operations and a warehouse in India exclusively contracted to PepsiCo. Leaders of the Federation of Food Workers of São Paulo(FTIASP) distributed the leaflet of the IUF campaign to the workers of PepsiCo plant at Campinas, São Paulo State. The leaflet calls on PepsiCo to remedy the rights violations in Pakistan and India. The union asked workers to support their co-workers in Pakistan and India. 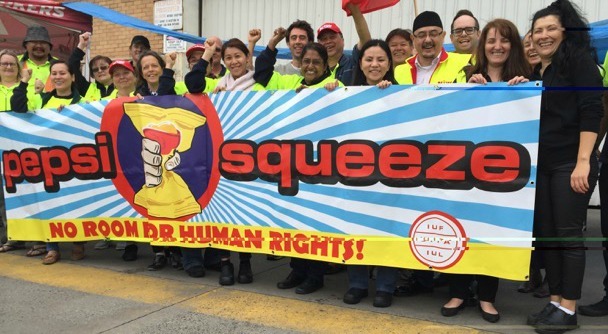 Similar actions are planned at PepsiCo Sorocaba plant and IUF affiliates in Brazil will continue to mobilize their members in the beverage sector in support of trade union rights for workers in Pakistan and India. 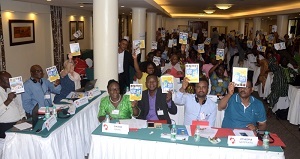 Delegates to the IUF meeting of unions representing workers in tobacco growing and tobacco processing met in Malawi on October 10-11 and expressed their solidarity with the ongoing fights in Pakistan and India and signed the postcards in support of the IUF international campaign. The IUF's European regional organization EFFAT's Youth Committee members have signed the postcards that are prepared in support of workers in Pakistan and India to call on PepsiCo to remedy the human rights abuses at PepsiCo snacks plant in Pakistan and the warehouse exclusively contracted to PepsiCo in India. IUF affiliates representing dairy workers shared their solidarity with PepsiCo workers in Pakistan and warehouse supplier workers in India who are fighting for their human rights violated by PepsiCo. Delegates to the IUF Mondelez International Trade Union Meeting held in Chicago, USA on September 20&21, 2016 showed their solidarity with the ongoing fight of workers for their union rights at the RKFL warehouse in India contracted exclusively to PepsiCo and at the Frito-Lay plant in Pakistan. The IUF-affiliated FGTB-Horval in Belgium joined the Manifiesta, an international and critical analysis of the conflicts on the planet, as well as a show of solidarity with oppressed people, on September 17-18 and expressed solidarity with the “STOP PEPSICOmplicity!” international union campaign of the IUF. More than 18,000 people visited the festival this year. The union called on PepsiCo to remedy the right abuses in India and Pakistan and distrubuted the leaflet of the campaign to the activists who have joined the festival. PepsiCo is complicit in violating the rights of a courageous group of workers at a warehouse in India, who formed a trade union and were fired as a result. 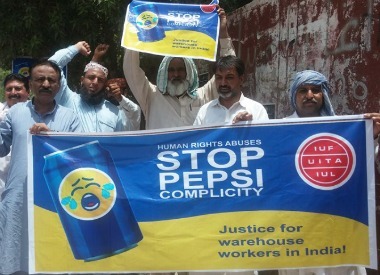 Whilst unfairly dismissed workers at this warehouse contracted exclusively to PepsiCo in India continue their fight for rights, the newly formed PepsiCo Workers' Union in Pakistan is fighting against forced transfers, harassment and targeting of union officers by management and the company's move to register a fake union at national level. 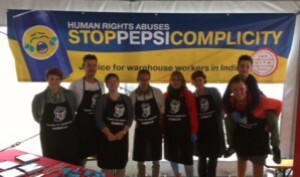 The IUF's governing Executive Committee met in Geneva, Switzerland September 7-8 and supported the “STOP PEPSICOmplicity!” international union campaign in support of trade union rights for workers at the RKFL warehouse in India contracted exclusively to PepsiCo. 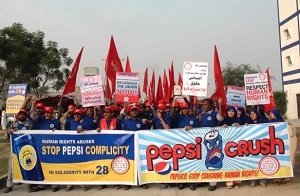 PepsiCo management at the company's Frito-Lay plant in Lahore, Pakistan has responded to the formation and official registration of a trade union with 650 members by harassing and transferring union officers and seeking to violate the union's collective bargaining rights by creating a bogus union. CLICK HERE TO SEND A MESSAGE TO PEPSICO! An International Brewery Workers' Conference held in Istanbul, Turkey with the participation of 60 delegates from 24 countries included a discussion about the ongoing fight in India and delegates to the conference signed the postcards in support of “STOP PEPSICOmplicity!” international campaign. Shop stewards and union officers of the IUF-affiliated unions in Ukraine joined an IUF seminar in Donetsk region and saluted the ongoing and determined fight of 28 PepsiCo warehouse supplier workers in India. IUF affiliates representing Nestle workers shared their solidarity with PepsiCo warehouse supplier workers who are still fighting to win back their rights in India supported by the IUF international union campaign, “STOP PEPSICOmplicity!”. 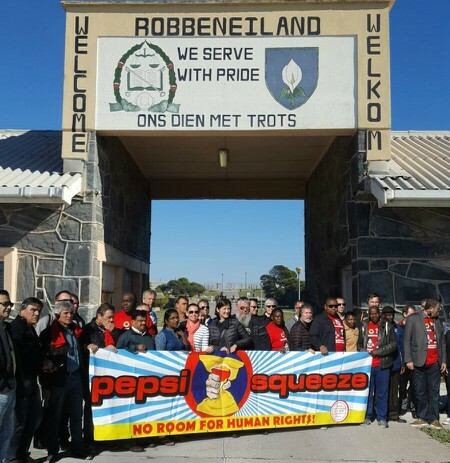 Delegates to the IUF Dairy Conference held in Cape Town, South Africa expressed their solidarity with the dismissed workers at a warehouse supplying PepsiCo in India. 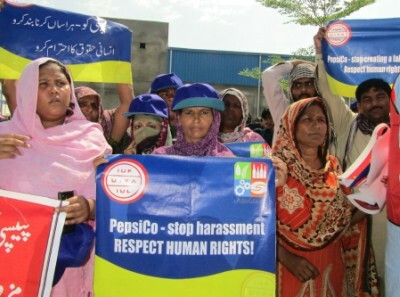 Whilst PepsiCo workers elsewhere in Asia are struggling to exercise their basic rights, on July 23 the new PepsiCo Workers' Union in Pakistan took a step forward when it was officially granted collective bargaining status by government authorities. 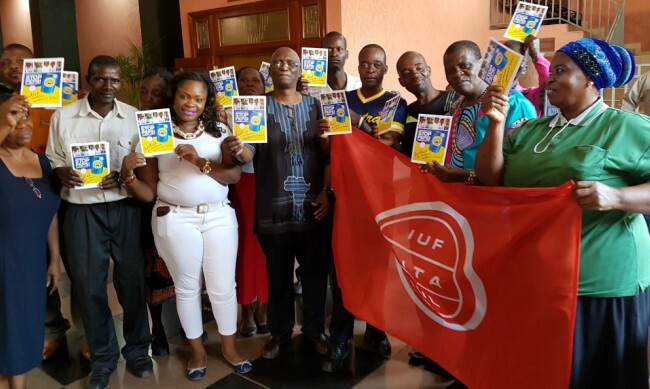 The IUF-affiliated PepsiCo Channo factory union members call on PepsiCo to engage in serious and good faith discussions with the IUF to reinstate the 28 dismissed workers with full back pay and guarantees that they can exercise their right to form or join a union without fear of reprisal. The IUF-affiliated Hotel Chitthu Township Labour Organization in Myanmar shared their solidarity with 28 workers who are determined to win back their rights at the RKFL warehouse in India contracted exclusively to PepsiCo. The IUF-affiliated Pakistan Sindh Sugar Mills Workers Federation and All Sindh Agriculture Research Regional Employees Union support the STOP PEPSICOmplicity campaign. GSK Nabha Union members in Punjab salute the union struggle of RKFL warehouse workers in West Bengal contracted exclusively to PepsiCo. The IUF-affiliated Pakistan Food Workers Federation members from Lahore, Rahim Yar Khan, Faisalabad & Multan joined the IUF's STOP PEPSICOmplicity international union campaign in support of trade union rights for workers at the RKFL warehouse in India contracted exclusively to PepsiCo. IUF members marched with the campaign banners in their international Workers' Day celebrations. 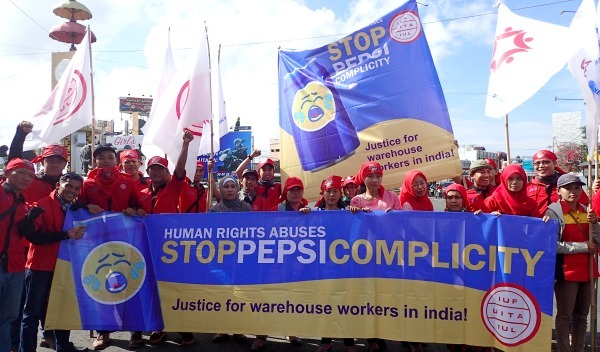 The IUF-affiliated Federation of Lampung Workers' Unions joined the May Day rally with STOP PEPSICOmplicity banners and showed solidarity with the ongoing fight of the unfairly dismissed warehouse workers in India contracted exclusively to PepsiCo. Stewards of the IUF-affiliated UFCW support trade union rights of the dismissed workers at the RKFL warehouse in India contracted exclusively to PepsiCo. Global drink and snacks giant PepsiCo is complicit in ongoing human rights violations by a warehouse provider in the Indian state of West Bengal. Since 2013, IUF members have been supporting a courageous group of warehouse workers who are unemployed as a consequence of insisting on their right to form a trade union. The company which dismissed them - Radhakrishna Foodland Pvt. Ltd (RKFL) - operates a warehouse contracted exclusively to PepsiCo. STOP PEPSICOMPLICITY! CLICK HERE TO SEND A MESSAGE TO PEPSICO! Legal Representatives of the CNTA affiliated Sitac union and PepsiCo signed an agreement to regularize 300 agency workers at the packaging department of PepsiCo's Elma Chips in Campinas in Sao Paulo state. Delegates to the sub-regional IUF conference on social impact of the EU partnerships held in Odessa, Ukraine expressed their solidarity with the dismissed workers at a warehouse supplying PepsiCo in India. For more than two years the IUF has called for the reinstatement and full restoration and guarantees of the human rights of the 28 unfairly dismissed workers at a warehouse run by Radhakrishna Foodland Pvt. Ltd that exclusively supplies PepsiCo in West Bengal. The IUF-affiliated AIWU organized a seminar for union activists in Ukraine, Dnipropetrovsk. Activists salute the ongoing and determined fight of 28 PepsiCo warehouse supplier workers. IUF affiliates representing Heineken workers shared their solidarity with PepsiCo warehouse supplier workers who are still determined to win back their rights in India. Participants to the concluding conference of the organizing project in rural areas in Ukraine showed solidarity with the ongoing fight of the unfairly dismissed workers at a warehouse exclusively contracted to PepsiCo in India. The IUF-affiliated FGTB HORVAL organized a shop stewards meeting for its West-Flanders region on January 15 2016. Shop stewards were informed about the ongoing fight in India and they signed the postcards in support of “STOP PepsiSqueeze!” international campaign. Women's committee of AIWU in Ukraine organized a meeting on January 13-14 2016 and joined the solidarity actions taken by the IUF affiliates in support of the unfairly dismissed warehouse workers exclusively contracted for PepsiCo in India. Young workers from Hong Kong, Taiwan, Korea, Philippines, and Indonesia met in Kaohsiung, Taiwan to work on the preparation of the Asia-Pacific Young Workers Organizing Conference in 2016 and demanded justice for dismissed workers at a warehouse supplying PepsiCo in India. The First National Conference of Nestle Unions in Russia supports the fight of dismissed workers at a warehouse supplying PepsiCo in India. 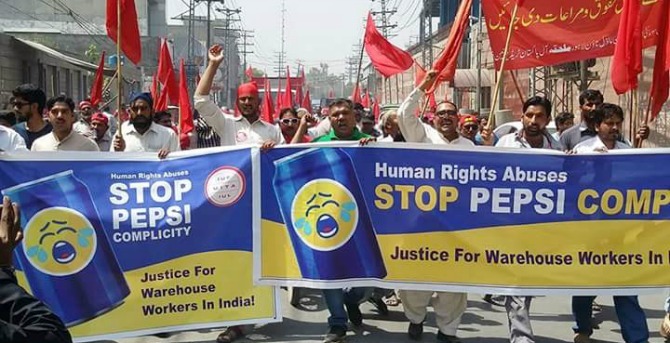 International trade union support at home and abroad continues to build for the struggle for workers at warehouses in West Bengal, India contracted to PepsiCo who were sacked after forming a union in 2013.